When I was young boy a refrigerator was the place you went to get a cold drink or some ice cream.We didn’t think much about the color or style of the refrigerator, it was there and as long as it kept everything cold we were happy. Today’s refrigerators come in a plethora of styles and features, Top Freezer, Bottom Freezer, Side by Side, French Door, Four Door, Extra Outside Access Doors, Wine Chilling Compartments and even Sparkling Water Dispensers! Top Freezer refrigerators have been around for decades and date back to the early days of refrigeration when an “Ice Box” was just that, an insulated box on legs in which your local ice man placed a block of ice to keep everything cold. 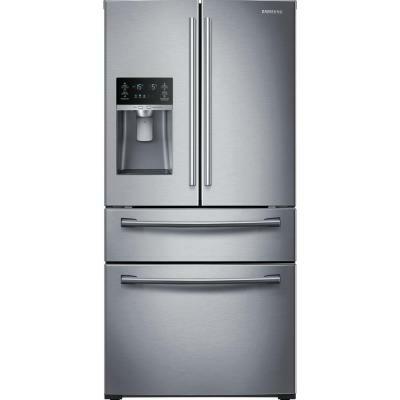 Modern day Top Freezer refrigerators come in several handle styles and colors and offer a great valve in the refrigerator market place with good sized models selling for less than $800.00! Top freezer models are compact and work well where space is limited, such as in a small apartment or townhouse. Bottom Freezer refrigerators offer the convenience of having the refrigerator section on the top and the freezer on the bottom. Since we access the refrigerator section more often than the freezer, having the refrigerator section on top makes a more convenient arrangement. You can see and reach items easily without stooping. Older bottom freezer refrigerators had a swing open door on the freezer; modern models use a slide out drawer. Side by Side refrigerators offer the convenience of having the freezer and refrigerator side by side with the refrigerator section on the right and the freezer on the left. 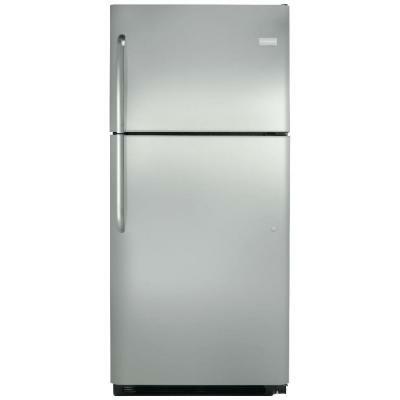 They offer the convenience of having easy access to both freezer and refrigerator sections. 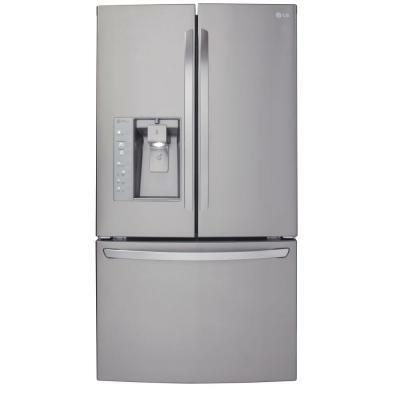 Newer side by side models offer ice makers on the freezer door to save space, and an ice and water dispenser on the front. Side by side units are a good choice for a smaller kitchen where space is a premium, with two equal sized doors; access is easier than a top or bottom freezer model with one large full size door. 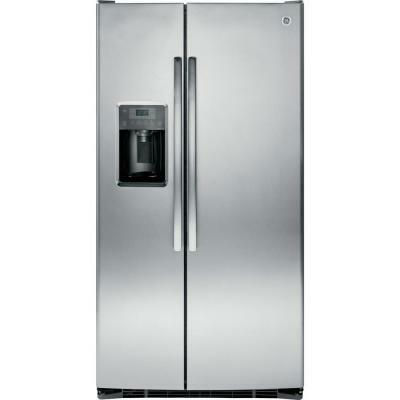 French Door refrigerators offer the convenience of an upper refrigerator section with two smaller doors and the freezer section on the bottom. The two upper doors are no wider than those on a side by side refrigerator making access easier. The full width refrigerator section offers a wide unobstructed storage space allowing you to store left over pizza, a party platter or a sheet cake with ease! And they offer a full width deli drawer as well! Interior shelves fold back for tall items and many have two or more crisper for fruits and vegetables. The bottom freezers have two or three sliding shelves to make organizing your frozen food easy. 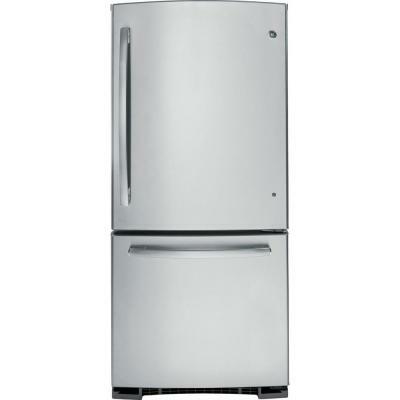 Four Door refrigerators offer a second smaller refrigerator section in the form of a slide out drawer. This extra drawer allows you to store items for quick and easy access such as snacks, cold drinks or yogurt. Just pull open the drawer and grab what you want. No need to open the regular refrigerator section and let all of the cold air escape. Some newer models off a split freezer section with separate temperature controls, allowing one side of the freezer to function as freezer, chiller, wine cooler or refrigerator space! Twin cooling, many models now offer twin cooling, the refrigerator has two condensers, one for the refrigerator section and one for the freezer. This allows the two sections to be sealed off from each other to maximize the efficiency of the refrigerator. Humidity levels can be higher in the refrigerator to keep food fresh and low in the freezer to prevent frost buildup and freezer burn. Easy Access Outer Doors, same new models offer an easy access outer door on the main refrigerator door. This door allows access to often used items such as milk, eggs and butter without opening the main refrigerator section. Sparkling Water Options, Samsung now offers a sparkling water option on some models. The refrigerator has a port for a CO2 cartridge. This allows the water to be carbonated as it is dispensed, giving you sparkling water at the touch of the button! Counter Depth refrigerators, many manufacturers offer counter depth refrigerators, these refrigerators are designed to fit a 24 inch deep space allowing the refrigerator to be flush with the counter for a clean built in look. Counter depth models have a smaller capacity than regular depth models and often cost more. 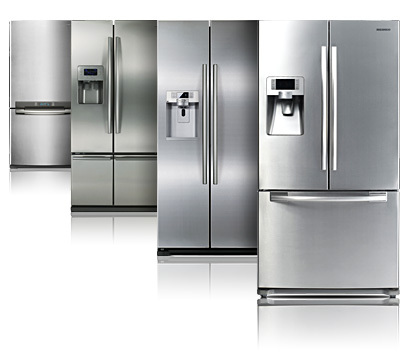 All refrigerator manufacturers offer a 1 year warranty on the entire refrigerator, with longer warranties such as 5 to 7 years on the refrigeration system. Home Depot offers the Home Depot Protection Plan which gives you an additional 2 or 4 year extension of the manufactures one year warranty. For the price of one service call you can cover your entire refrigerator for 5 years! New appliances are not as reliable as in the past and they contain more electronics, making repairs often very expensive. The Home Depot Protection Plan will give you peace of mind for 5 years! And if we cannot fix your refrigerator we will Replace It! So which refrigerator is best for you? When shopping for a new refrigerator consider the following. 1. Family Size, how many people are there in the household? A small household with one or two adults can use a Top Freezer or Side by Side refrigerator. Larger households should consider a larger French Door model. 2. Size of your kitchen, side by side models often work best for a small kitchen. The doors are half the width of a refrigerator with one single door and both the refrigerator space and freezer have easy access. Larger French door models may protrude too far into the room and the freezer drawer may be difficult to access in kitchens with limited space. 3. Cost, price is a consideration in any purchase, smaller Top Freezer and Side by Side models are often far less expensive than the larger French Door models, often by thousands of dollars! Consider your needs and your budget before shopping. 4. 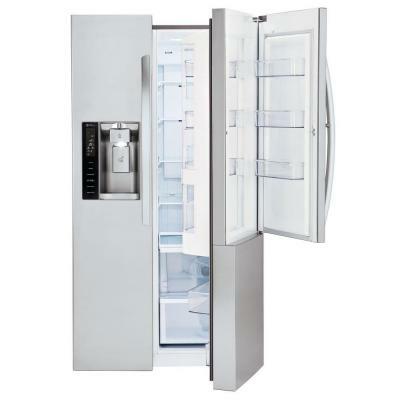 Features, if you enjoy lots of convenience features such as easy access doors and multi tear freezer sections consider one of the new French Door models, some offer dual ice makers, second refrigerator drawer options, convertible freezer sections and wine chillers. They will make life easier and more fun! Anyone for a glass of sparkling water?